Who doesn't love pizza night!? Perfect fall flavor combo - Pumpkin to pull it all together! AND it takes less than 15 minutes to make! 1. Heat your oven to 375 - while it's heating dice up your veggies and chicken sausage. 2. Place your flatbread on a parchment paper covered cookie sheet and place in the oven for 4 mins. 3. While the flatbread cooks, saute your onion, jalapeno & chicken sausage. 4. Once flatbread is finished, take out and load up with toppings! 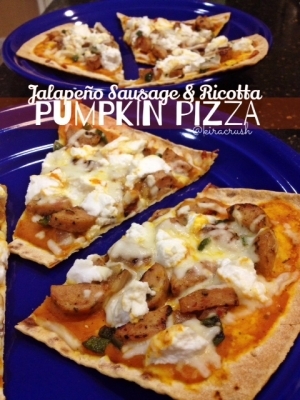 Spread out your pumpkin sauce, top with onion, jalapeno & sausage, load up with shredded mozzarella and finish with the ricotta. 5. Place back in the oven for about 4-5 minutes or until the cheese melts to your liking. Let cool, slice and enjoy!